okay, this child rules my child's world. we are now officially in full dora worship. this probably explains why about 75% of the presents cookie puss recived this year had some form of the dora franchise stamped on it. 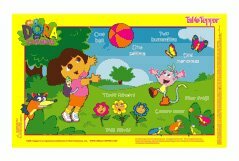 don't get me wrong, i love dora, she's absolutely adorable and an excellent roll model for young girls. my little cookie is even learning spanish (even though daddy wants her to learn italian first, it's a barese thing). we now have a dora salsa-dancing doll, christmas dora DVD (complete with 3 regular-time episodes), several dora outfits, matching dora hat and gloves, a dora papasan chair (cookie-sized) and a dora collapsable fabric hide-away house. it's like the 10-10 WINS of dora - all dora, all the time! but if it makes cookie happy and keeps her sane and quiet (few and far between moments for mommy and daddy) it's all good. and just so you know that my child's interests are not so limited, she also loooooves diego! There's also this book about Dora going to the dentist. Or was that the doctor...? Well, whatever that book is, it can help some kids become more confident when stepping inside the dentist's office.